Some gemstones display different colors when viewed from different angles. These gems are known as diachroic (two colors) or pleochroic (more than 2 colors). The reason for this phenomenon is the double refraction of light. In most minerals light entering the crystal follows two different paths at different speeds. Depending on the shape of the crystal, the optical parameters will change according to the viewing angle. Gems that are notable for their pleochroism include tourmaline, andalusite, iolite, kunzite, kyanite, sphene and tanzanite. Some unusual gems will display multiple colors under the same viewing conditions. These bicolor and multicolor gems often have regions or zones of different colors. Tourmaline especially is noted for this property, and bicolor tourmalines are relatively common. 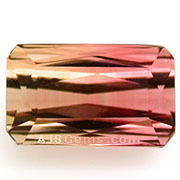 The most famous bicolor tourmaline is the so-called watermelon tourmaline which displays bands of green and pink/red. 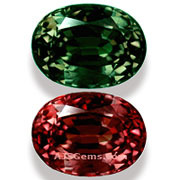 While different colored zones in a single gemstone is associated most with tourmaline, the phenomenon does occur occasionally in other gem varieties. Ametrine, combining purple amethyst and golden citrine in the same stone, is the most well known example. 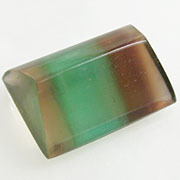 Fluorite is sometimes found with bands of different colors such as white, green and brown. 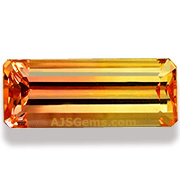 We recently acquired a very rare imperial topaz that displays separate areas of pink and gold. Another group of multicolor gems are known for their color change. These gems display different colors occur to the lighting conditions. 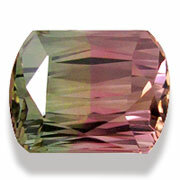 A fine alexandrite, for example, will appear green in natural light and reddish purple under incandescent lighting. Color change specimens are also found occasionally in sapphire, garnet and fluorite. Gems with a strong color change are very rare and sought after by collectors. Recently we found some top grade garnet from Kenya that displays quite a strong color change.